A HOME INSPECTION IS A VISUAL EXAMINATION OF THE PHYSICAL STRUCTURE AND SYSTEMS OF A HOME. 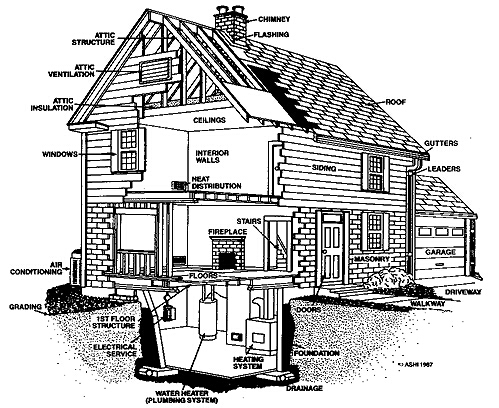 THIS LINE DRAWING ILLUSTRATES THE COMPONENTS EXAMINED IN A HOME INSPECTION ACCORDING TO THE STANDARDS OF THE AMERICAN SOCIETY OF HOME INSPECTORS. If you are considering Buying a Home, whether it is a Single Family, Multi-Family, Condominium, Manufactured or Mobile Home, you should have it Properly Inspected before the final purchase by an Experienced and Impartial Professional Home Inspector. The purchase of a Home is probably the largest single investment you will ever make. You should know exactly what to expect both inside and out, in terms of repair and maintenance. A fresh coat of Paint could be hiding serious structural problems. Water marks in the Basement, could be the indication of seepage problems or of a one time occurrence. The Home Inspector interprets these and other clues and presents, to the buyer, his professional opinion of the condition of the property before the final sale, so as to avoid unpleasant surprises afterwards. A Home Inspection should also point out the Positive Aspects of the Home as well as Maintenance tips that will keep it in good condition. After the Inspection, you will have a better picture of the property you are about to purchase and you will be able to make your Final Decision More Confidently. If you are considering Selling a Home, an Inspection can detect problem areas that may need repair. This can help eliminate the need for additional negotiations, at the time of sale, over the cost of these repairs. Buyer: The time to have a Home Inspection is after the Purchase & Sales Agreement has been signed by both parties. Most Real Estate Companies will allow between 5 and 10 days for this task. Your real estate transaction is rapidly approaching closing and you still need an inspection! Seller: A Home Inspection should be considered before putting the House on the market. This will allow time to review the Inspection Report and repair any deficiencies that could cause a problem at the time of Sale. NEVER use a relative or friend for an inspection that you will base your final decision on. Family and Friends may be well-intentioned inspectors but they are too emotionally connected and will not provide an impartial view. Even the most experienced homeowner lacks the knowledge and expertise of a Professional Home Inspector who has evaluated hundreds, possibly thousands of homes in his career. Inspectors are familiar with all aspects of home construction and with the proper installation techniques of its components. It should also be noted that Home Buyers find it very difficult to remain completely objective and unemotional about the Home they really want. 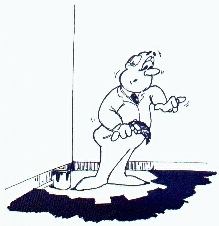 This can lead to poor decision making and costly mistakes when evaluating the property.